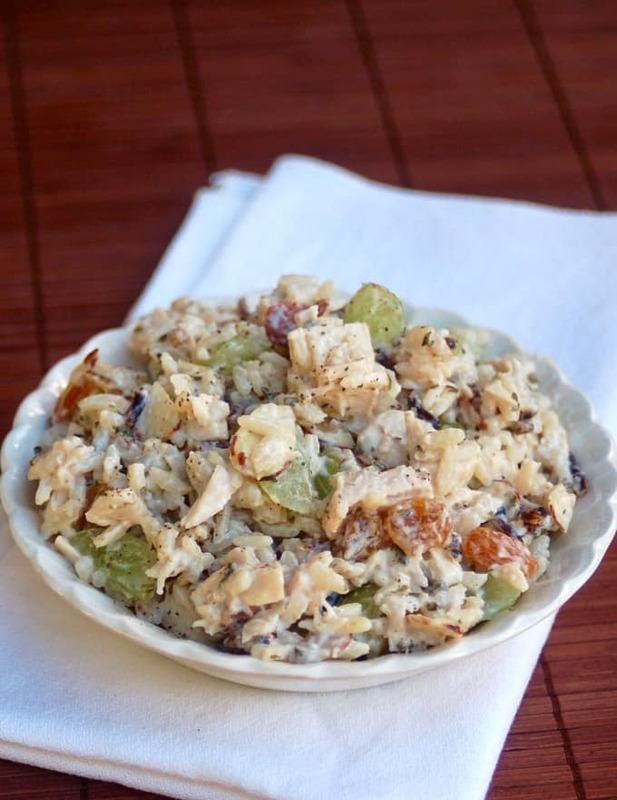 Simple and delicious, this chicken and wild rice salad is a new favorite at our house. The only thing that has to be cooked is the wild rice blend. (I like either Uncle Ben’s or Far East brands. ), provided you’ve got leftover rotisserie chicken at the ready. I used half light mayonnaise and half plain non-fat Greek yogurt but all of one or the other would be fine. This yummy chicken and wild rice salad can be amended a multitude of ways to suit your tastes. 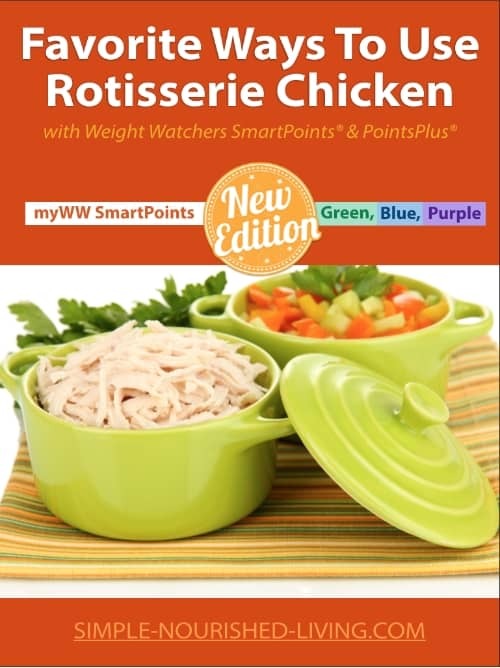 How Many Calories/WW Points in this Rotisserie Chicken & Wild Rice Salad? According to my calculations, each 1-cup serving of this salad has 290 calories, *8 Weight Watchers PointsPlus, *4 WW Freestyle SmartPoints. Enjoy! Savory: skip the grapes and instead add chopped red bell pepper, scallions and artichoke hearts, etc. 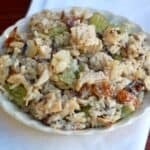 If you’ve made this Chicken Salad with Wild Rice, please give the recipe a star rating below and leave a comment letting me know how you liked it. And stay in touch on Pinterest, Facebook, Instagram and Twitter for the latest updates. 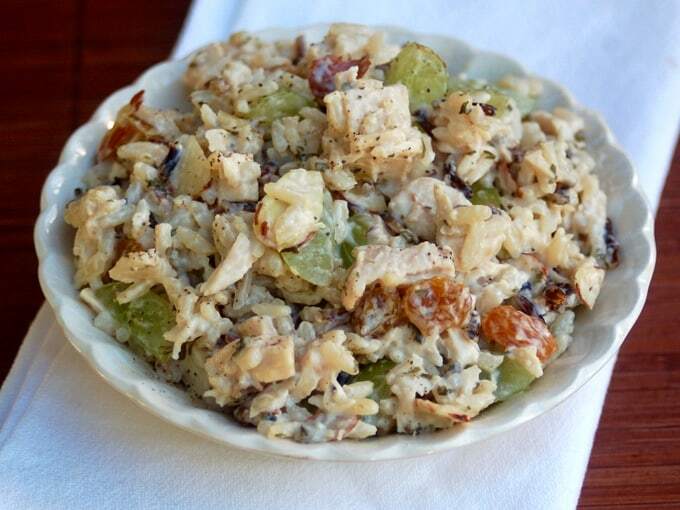 Simple and delicious, this chicken and wild rice salad is a new favorite at our house. The only ingredient that has to be cooked is the wild rice blend, provided you've got leftover rotisserie chicken at the ready. Cook the wild rice according to package directions, just until the rice is barely tender. 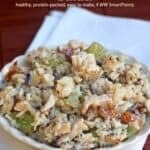 In a large bowl, mix the cooked rice, shredded chicken, grapes, almonds, mayonnaise and Greek yogurt together until well blended. Season generously with salt and pepper, adjusting ingredients to taste. If you use a fresh rotisserie chicken and just cooked rice, the dish will be ready to serve warm, or you can chill it first if desired.